I’d like to ask this twit how Quomo and the Democrats plan to make every criminal, panhandler, and chronic heroin user (citizens all) feel “fully included”…and how do they plan to see to it that those who choose to live a low life are “contributing to their maximum potential?” What they describe is perfection that can never be reached as long as humans are flawed their natural flawed selves…free will…free choice. Democrat policy seem to be hell bent on feeding the flaws. Succees is less than 2% growth and lots of needy dependent people. Trump was elected with a slogan, MAGA, that offered real hope and change for many Americans who had suffered greatly for years under Obama’s Democrat socialist policies. Americans had been told that his lousy economy was the “new normal”…that stronger growth just might not be possible and they should just accept it. Food stamps were the crumbs they offered to compensate for the bad economy and worthless health care. What has happened since Trump said he would make America great again? This month 4.1% GDP growth was announced. Today The Wall Street Journal reported that youth unemployment “fell to it’s lowest level in more than 50 years!” Wages are beginning to rise…WalMart Exec’s announced today, “This is the Best Economy for Our Customers in Decades” Makes sense unemployment levels for all groups are way down and people finally have some extra money in their pockets to spend. A Rasmussen report issued this week found Trumps job approval rating among blacks has doubled from last year to 36%. And there is so much more going on every day as Trumps administration works to solve problems. Imagine if Americans worked as hard in their own families and communities to make America great? Trump is restoring America to the greatness that the American people, living in freedom under our beautiful Constitution, have created and can create through hard work and creativity. He is restoring America to the strong nation that has been a defender of freedom and equality, not just here in America, but in nations all across the globe. No nation is perfect but America is unique in all the world…a very special place that we should all be proud to call home. I suggest those who are trapped in the grievance business, trapped in the protest game, trapped in failed socialist ideals get off that bandwagon and take advantage the freedoms they already possess to build whatever life they desire. Nobody in America is subjected to discrimination that cannot be overcome with imagination and hard work. The Old South closed lunch counter does not exist. If a woman wants to become CEO then let her start a business and grow it into something she can be proud to cal her own…by her own effort.You are not your feelings people…get out of your heads and get to work! And for heavens sake…learn the valuable lesson that words cannot hurt you or stop you unless you choose to let them. Quomo and company don’t appreciate what they have here in America and care only about gaining and keeping power over other people. Quomo has hinted at running for president in 2020. This entry was posted in Liberty, Morals and Ethics, Patriotism, Protest and Agitation, Race Relations. Bookmark the permalink. 12 Responses to America Was Never Great? “Worm” being the operative term here. Which is a shame. He should own it and so should the Democrats. “America, It Was Never That Great” is a cracker of a slogan. I love this. It is a winning slogan. Cuomo is leading the way, Democrats take note. This is awesome. I am impressed. Add this to a platform of open borders, raising taxes and defending the “spark of divinity” in MS-13 and you have a formula for sweeping not only the mod-terms but 2020. Seriously, pick up the ball and run with it. Lippy, start dancing with glee. Wow…missed that “spark of divinity” reference…incredible! I agree. Cuomo took their bankrupted platform and created a banner. Every now and then they let their true intentions and feelings show. And don’t forget, “You didn’t build that”. Michael Pillsbury, an expert on China begs to differ with Cuomo. Must watch to the end. Peggy I saw this interview when I was recovering from Pneumonia…excellent! The Chinese government has shown this president the highest level of respect and see him as a fearless tactician. The trade negotiations are working. Trump knows what he’s doing on this level and…on the simple minded level of the American left press who continue to cover petty imaginings while missing the real important stuff…man are they dumb. I saw another expert on China (economic) who said the Chinese economy is under a great deal of pressure with falling GDP. It would be in their best interests to cooperate in the trade deals…peace and prosperity fr everyone is the goal. Of course humans being human….. Pneumonia? Wow, sorry to hear that. From all the smoke and ash? Hope you’re on the road to a complete recovery. My little 13 year old pup also got a lung infection last week. Vet said to wash the ash off the patio because he was only a foot above what had built up on the ground. He was on meds for 10 days and is doing good now. I’m hosing off everything from the roof down and washing it into the rocks and lawn where I wash it in as much as possible. People forget Trump went to a military school for 5 years where he was taught both strategic and tactical ways to resolve and win issues. He’s dealing with most politicians and reporters who never served in the military and have no idea they are being outmaneuvered. He IS playing three-level chess while they’re playing checkers. It really is entertaining to watch. And more enjoyable to hear those who said he didn’t know what he was doing now say they agree with him. Just this morning a very critical reported of everything he’s done said she agreed with what he was doing with China. Read another district judge decided to play president again and prevent Trump from moving forward with his agenda. Congress is going to have to step in and stop this. No appointed district judge should be able to have more than an elected US president. Thanks Peggy, yes I’m on the mend now. The smoke sure didn’t help my recovery…not sure how I got it. It is amazing to watch the man. Xi Jinping has acknowledged Trump is a brilliant negotiator and so far we are winning! A shift happened with Trump. Many things have been effected including the power in the left judicial arena. Powerline, “Is Trump Winning Again? features two articles pointing to an impending meeting with China and a trade deal…both from people that are not fans of Trump! One is a lefty editor of The American Prospect. 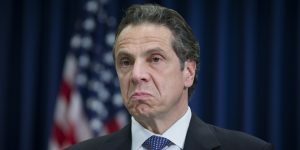 Another Cuomo scandal exposed showing how socialist benefit at the expense of the common folk.